Acquiring the ability to count and write numbers is an important first step of learning. 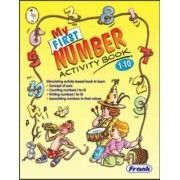 This book has been carefully designed to provide the early learner with the skills necessary in counting and writing the numerals 1-10. The concept of 0 has been introduced. Children learn best by doing things, the book contains a number of enjoyable activities.